Chinese scientists have invented a new material that can block the unnecessary sunlight and produce power. Previously, windows could do only one thing, either to be tinted and shut out sunlight, to reduce the heating and cooling cost, or to use see-through solar cells to generate electricity. Windows using this new material can do both and it is expected to cut the average household’s electricity bills by half or more. The material was invented by Hin-Lap (Angus) Yip, a professor of materials science and engineering at the South China University of Technology and Fei Huang, also of South China University. The Chinese team combined both material innovation and optical thin film design to achieve this goal. 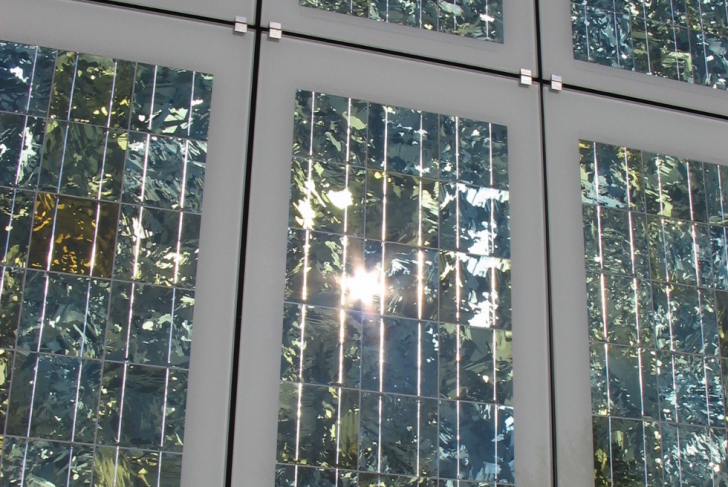 This kind of windows can simultaneously generate and save power. Constructing the first prototype required the scientists to precisely balance harvesting light to make electricity and blocking it, mixing and matching from among a variety of materials and chemical compounds to find exactly the right working combination. The prototype of the product allowed a visible portion of sunlight to pass through but reject infrared light, which is a major heating culprit. Then, the researchers transformed the near-infrared region of light into an electric current. They used a polymer semiconductor because it can selectively absorb the near-infrared light but allows most of the visible light to pass through it. For energy harvesting, they made organic photovoltaics into semi-transparent, lightweight and colorful films. Both materials are perfect for turning windows into electricity generators and heat insulators. The polymer solar cells on the flexible substrate can be manufactured using the roll-to-roll printing process. The production consumes less energy and has a lower carbon footprint than a production of conventional silicon solar cells. It has a number of potential applications since it is a flexible and roll-able film. Yip believes that it can be used as a window curtain: “Nowadays, many curtains are controlled electrically to open and shut, and since our photovoltaic window film will generate electricity, the same electrical circuit can be used to carry out the power, which can be then directly used or stored to power other facilities in the house.” Another implementation can be a self-powered greenhouse. The scientists estimated that the current version of the material if every square inch of every window would have panels made of multifunctional solar cells, can reduce the average household’s reliance on external electric sources by more than 50 percent. Additionally, they didn’t even use the best organic PVs that are on the market. Therefore, this material can be improved significantly. The only problem is that it costs more than traditional films, but it could pay for itself fairly quickly. The material could be in commercial use within five years.